Attention Washington visitors: Just because you can buy, use, and possess a limited amount of marijuana or marijuana-infused product during your visit does not mean you can smoke or consume it anywhere. It is by no means a weed free-for-all in Washington State and if you light up in the wrong place you might end up with a citation, or worse. The better question is where you can't (see below), as that list is much longer. Smoking weed is within the law if you are on private property, outside the view (or smell) of the general public. When in doubt, ask first. At this time, state law regarding pot smoking at private clubs is still being reviewed but remains unlikely. The places where it remains illegal to use marijuana around the state are many, so knowledge of where to avoid use will help keep you on the right side of the law. Pot smoking is definitely illegal in public and in view of the general public. In and around cities and towns, indoors and outdoors, the application of smoking and drinking laws combined with a little common sense applies. If you aren't allowed to smoke or consume alcohol in a place, it's a good bet that you'll also be legally prohibited from smoking or consuming pot in any form. If you can't smoke tobacco somewhere, it will be illegal to smoke anything else there as well. Washington State has very strict laws about public smoking, so this rules out a long list of places, including restaurants and bars. Most hotels and places of business also have no smoking policies. Washington is one of the many states where having an open container of alcohol is prohibited in public places as well as in your vehicle. Always remember that marijuana use and possession is still against federal law (national law). Many popular visitor attractions in Washington State are on federal land, including national parks, national monuments, national wildlife refuges, and national forests. Military and Department of Energy lands are also federally owned. Many mountain ski slopes are located on federal land. 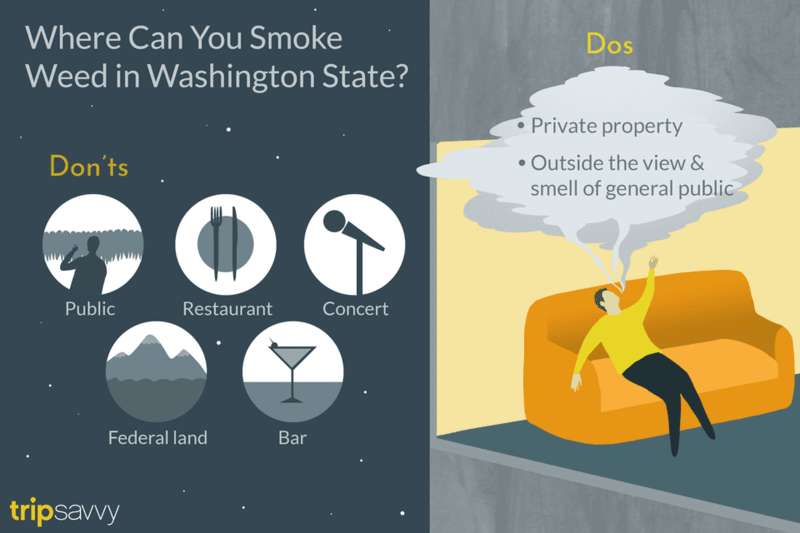 While not all-inclusive, here are the highlights of the places where YOU ARE NOT ALLOWED to smoke pot or consume cannabis products in Washington State. You definitely can't smoke pot while driving a car, or even when you are a passenger. It would also be asking for trouble to smoke weed in a parked car. What If You Get Caught Smoking Pot in the Wrong Place? If state or local law enforcement catches you smoking weed or consuming marijuana where it remains illegal, you might receive a ticket or citation and have to pay a fine. Some hotels may charge a service/cleaning fee. If you are caught with marijuana by federal agents on federal lands, the penalty may include a citation, losing your driver's license, performing community service, and/or a probationary sentence.